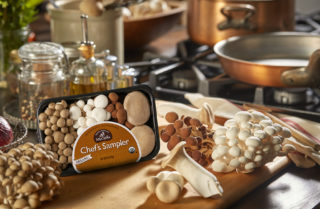 Gourmet Mushrooms, Inc. is committed to growing the finest quality specialty mushrooms using sustainable practices. We have been pioneer growers of fresh culinary mushrooms since 1977, when we were the first to commercially cultivate shiitake in the United States. We are located in Sebastopol, CA and currently grow seven varieties of specialty mushrooms, all certified organic and Kosher.